If America wore a pair of shoes, the soles would be made of butadiene. The monomer is the building block for just about every major synthetic plastic or rubber. Tires: Styrene-butadiene. Fuel hoses: Nitrile-butadiene. Legos: Acrylonitrile Butadiene Styrene. It’s important stuff, and researchers at PNNL have just developed a new catalyst capable of converting ethanol—a grain alcohol fermented from many renewable sources, such as corn, switchgrass, algae, and even waste gas from steel mills—directly into butadiene. Traditionally, butadiene is produced from petroleum via a refining process known as steam cracking. In the past, refineries used heavy crude oil, which produced high yields of butadiene. However, with the rise in use of shale-oil or light-weight crude oil, butadiene production volumes are in danger of dropping while demand rises. As part of a project sponsored by DOE’s Bioenergy Technologies Office, researchers at PNNL are working on ways to generate butadiene from renewable sources. While ethanol-to-butadiene catalysts aren’t particularly new, previous catalyst systems weren’t commercially viable. First, the catalysts were not active, necessitating the ethanol to be passed multiple times through the catalyst, or operated at very low throughputs, to reach a 70 percent yield—the amount of ethanol that converts into butadiene. Second, previous catalysts required pure ethanol—ethanol without any water in it. 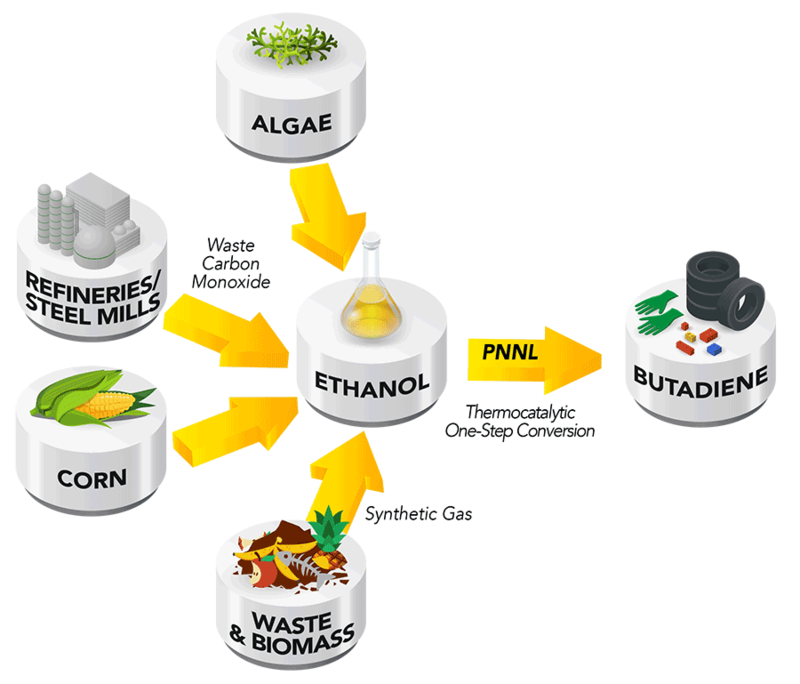 Separating water from ethanol adds an additional step and cost to the overall process. PNNL scientist Robert Dagle and his team recently developed a single-step catalyst capable of converting about 70 percent of ethanol to butadiene in a single pass and at industrially relevant process conditions. The catalyst requires no pre-preparation of the ethanol; aqueous ethanol can be used. The catalyst uses silica as a support material, with silver nitrate powder and zirconyl nitrate as the catalytic materials. It works by ripping hydrogen off the ethanol molecules, creating acetaldehyde—a compound that typically occurs naturally in coffee, bread, and ripe fruit. Carbon-to-carbon bonds follow, producing crotonaldehyde—which occurs in a variety of foods like soybean oils. The crotonaldehyde is then converted to crotyl alcohol, which undergoes dehydration, resulting in butadiene. As far as Dagle knows, the PNNL-developed catalyst is the most active ethanol-to-butadiene catalyst reported. To get such a sufficient catalyst required the team to balance the components of the catalyst just right, in particular, its acidity. Too much acidity and ethylene would be produced. Too little acidity and the team was left with unreacted acetaldehyde. 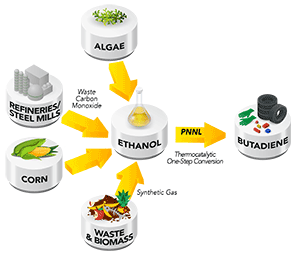 PNNL’s catalyst opens the door to the possibility of ethanol as a source of butadiene instead of petroleum. If successful, the ethanol-to-butadiene catalyst could be a boon to the $23 billion butadiene market. This research was also featured on the DOE Office of Energy Efficiency and Renewable Energy’s Bioenergy website.